Every creature in the multiverse has a story to tell — even the monsters. Uncaged is a collection of myth- and folklore-themed adventures written for Dungeons & Dragons 5th Edition. Each original adventure subverts tropes around a female mythological creature or monster including hags, harpies, medusas, and much, much more. Volume I is currently available as both a hardcover book and a digital PDF! Both print and digital include a special foreward by Jasmine Bhullar, star of Relics & Rarities on Geek & Sundry! 25 original adventures for tiers 1-4. Each adventure features a creature, monster, or character from folklore, fairytales, myths, and legends. Cover art by Samantha Darcy. Volume II arrives in May 2019! 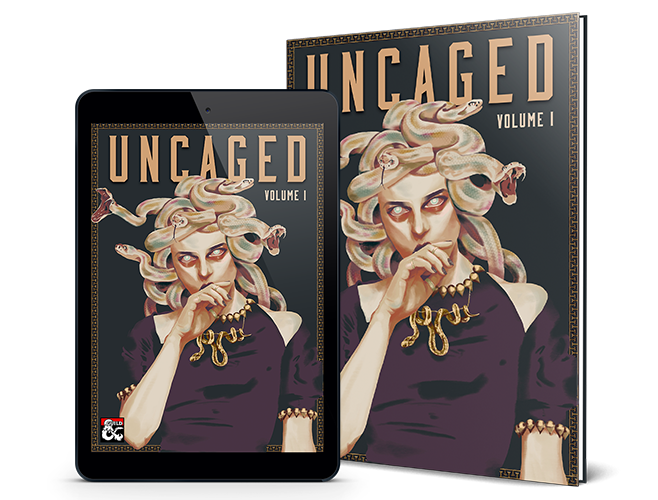 Follow #UncagedAnthology on social media for updates and announcements! I wish I knew before I bought this that it was so heavy on the neomarxism . DM's Guild needs better descriptions for some their content. I play and GM ttrpg to get away from the trappings of irl. Not marinate in it 24-7. I wish. it would have helped offset the cost of the book. Is there any plan to make some or all of these adventures Adventurer's League-legal (or maybe future volumes)? I sometimes run women and/or LGBTQ+ specific AL tables and would love to have these as a resource. Any word on when the problem will be fixed for iOS devices? I am really excited to see the artwork and the maps. I purchased the PDF some days before the hardcover release. Am I still eligible for a hardcover discount? That's how you do a 'printer friendly' version! Great material. Does this pdf contain separate map files that I can use on roll20? There is a pdf of printer-friendly maps that could possibly be scanned in, but there are not roll20 specific files. Hey Albert! We'll be sure to make a file with the separate maps. It's also on the agenda for future volumes. Thanks for your input! I'm interested in this book, but I am concerned about the content warnings mentioned at the beginning of the book, as seen in the preview. Could one of the creators or purchasers let me know what the specific content warnings are? The content warnings do not apply to every adventure. Each adventure has any applicable content warnings listed, although many of the adventures do not have a need for a content warning. These content warnings range from snakes to forest fires to sexism to domestic violence to infanticide to suicide with a lot of variety in between. However, most content warnings are unique to a single module and, again, many modules did not require a content warning at all. Is this sufficient or would you prefer a complete breakdown of warnings by module? Thank you for your response, Amanda L, that's helpful to know. A big question I have is whether sexual assault is in any of the content warnings. Abuse, PTSD, and domestic abuse are all content warnings included on one or two modules. However, sexual assault is not a content warning for any module. Ok, thank you very much for letting me know. Hi William! Amanda, thanks so much for sharing this information -- I'm sorry for my delayed response. William, I plan on adding the content warnings to the title listing; that should be updated this weekend, and we'll be sure to include those on the listings going forward. :) Thank you both! Hi William, sorry for the delay — the content warnings are included in the title listing now. Sorry for the delay on that but I hope that helps! When our next volume is out, we'll be sure to include those the day of release. Cheers! All the images and maps are missing from my PDF (Vol1_V4). Is there a version with the art? Very excited to get my hard copy and start running these adventures! "The Lauma" is also missing from the ZIP file. Hey Forrest! We're having an issue with the PDF not showing images on iOS devices. Can you send an email to lysa@onebookshelf.com? The Lauma is a two-page illustration and not technically an adventure. We're working on making a print-friendly version of the stat block. Can do, thanks for getting back so quickly! I came here to report the same problem. Specifically, the images in the adventure don’t display in iBooks for iPad, but do display fine in Acrobat reader on the same iPad, in case that helps. Thanks for the heads up. I haven't tried on an iOS device yet. But, on my MacBook, it was not displaying in Preview but was fine in Chrome. Can you give me a breakdown of the 25 adventures by tiers? In this volume, there are 14 tier 1, 6 tier 2, 4 tier 3 and 1 tier 4. Great! Most def want to pick up a hard copy too! Wonderful, thanks! I've quite enjoyed the digital copy and am looking forward to the hardcover. A really great collection of adventures, well worth purchasing. I really like the way the adventures turn what is usually just a monster into a personality. The adventures on the Medusa, and Succubus being really good examples. What will the next volume encompass. Is it me or is anyone else missing The Lauma from the Printable Modules section of the PDF zip file? PS - Very excited to read through these and run them at our public play events! Hey Tim! That whole spread is technically an illustration; I can try to make a print-friendly stat block to upload. Oh, I thought it was a module as I was filing the PDFs. Thanks for the clarification. Hey Bobby! We reuploaded the PDF with new settings. Let me know if you continue to have any issues! Hey Bobby! I'm sorry for your trouble! Can you shoot an email to lysa@onebookshelf.com? I just finished running "Lai of the Sea Hag" today for 2 level 4 characters. They had a complete blast. There was plenty of structure for me to jump right in, and things were loose enough that the party didn't have to stick to the railroad tracks. They had some extremely creative solutions to the situation. Really excellent and I can't wait to use more of the adventures! So glad to hear that, Gabriel! That's a terrific adventure! :) Excited to hear more about your party's future adventures. Is there any possibility that all four volumes might be collected in a single hardcover once released, or would that be too enormous to be feasible? Hey Thomas! Each volume is around 250 pages, so a full anthology would be about a 1,000 page tome. I am not actually sure if we could even print something that big through our current printer. But we can maybe do a special edition of it or something -- so I won't say "no," but it might not be something we can focus on for a little bit. :) Each separate volume will have a hardcover edition, if that helps! Okay, that's what I suspected. No worries, that just means I'll look forward to eventually having all four volumes on my bookshelf. Thanks so much for putting together this amazing project! I'm not able to leave a review because I'm a publisher, so I'll just come over to this side and say I would have left it five stars and a heartfelt endorsement. This is the first time I've seen such a diverse group of people write D&D work reflecting their own worldview and experiences, and it makes this a landmark, historic moment in DMs Guild and D&D publishing. Plus, we have a book of just fantastic adventures on top of those elements. I don't often talk publicly about my identity because I don't want it to be seen as a reason (or not) to engage with me, but I'm a lesbian, and it feels good to finally be "seen" in a work like this and unequivocally celebrated. Uncaged isn't about agenda, shock value, or anything besides telling stories from a perspective that many of the contributors share and all of them respect. Thank you to everyone who put their experiences, heart, and storytelling into Uncaged. This title was added to our catalog on March 11, 2019.